I recently attended a Banned Books Week Read-a-Thon, and was asked to read this small volume as part of the Read-a-Thon. The book is about the true story of two male penguins, Roy and Silo, who formed a six year relationship at the Central Park Zoo. When zoo keepers noticed them trying to hatch a rock as if it were an egg, the zoo keepers gave them the second egg from another pair to hatch, which they did successfully, raising the female, named Tango, as their own. 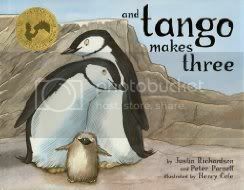 And Tango Makes Three is a simplified version of this story, to teach children that not all families are made up the same way. The accompanying illustrations were cute and went well with the tone of the story. The book was banned for obvious reasons; gay penguins are going to pervert America's youth, you know. I think the story was well presented, showing that there is nothing wrong with gay parenting, and that if the penguins can do it, and do it well, that it really can't be all that bad, can it? A good book for parents, gay and straight alike, to read to their children, to help open their eyes at a young age to this fact and show there is nothing wrong with families that may be looked on as being "different."